When we think about what is usually called ‘planetary protection,’ we’re talking about the probes we send to possibly life-bearing places like Mars or Europa. It would confound our investigations if we couldn’t be sure we hadn’t contaminated such a place with microorganisms from Earth, unwittingly carried aboard a lander that was not properly stripped of such passengers. Even our Cassini Saturn orbiter was guided into the planet as a way of ensuring that it would not, at some future date, crash into a place as biologically interesting as Enceladus. Yesterday, having looked at an essay by Ethan Siegel, I asked rhetorically whether we should think up some kind of exoplanetary protection policy as well. After all, we’re fleshing out an actual mission design through Breakthrough Starshot, aiming to reach nearby stars in coming decades. Siegel (Lewis & Clark College) had expressed his concern that Breakthrough Starshot might inadvertently start an interstellar war. The idea is extreme, but I use the word ‘war’ because it was right there in the title of Siegel’s piece. What Siegel worries about is that among the large number of payloads Breakthrough Starshot would like to send to nearby stars there might be one that accidentally impacted the planet under study. He’s concerned about the ‘cone of uncertainty’ that would be involved in any trajectory aimed at making a close pass of a planet like Proxima b and argues that at 60,000 km/sec, which is the Starshot goal of 20 percent of c, a tiny 1-gram payload will strike with the force of a 1 tonne asteroid moving at 60 km/sec, a hit like Chelyabinsk. Here is a map of asteroid impacts that Loeb linked to in his essay. 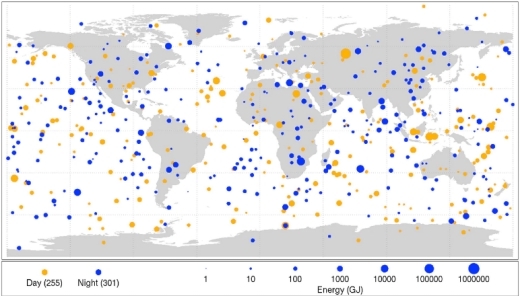 Image: This diagram maps the data gathered from 1994-2013 on small asteroids impacting Earth’s atmosphere to create very bright meteors, technically called “bolides” and commonly referred to as “fireballs”. Sizes of red dots (daytime impacts) and blue dots (nighttime impacts) are proportional to the optical radiated energy of impacts measured in billions of Joules (GJ) of energy, and show the location of impacts from objects about 1 meter (3 feet) to almost 20 meters (60 feet) in size. Credit: Planetary Science. The map, the work of NASA’s Near Earth Object Program, is instructive. All told, 556 small asteroids impacted our atmosphere in a 20-year period, almost all of them disintegrating in the atmosphere, with the obvious exception of the Chelyabinsk event, which was caused by the largest asteroid to strike in this timeframe. My understanding about Chelyabinsk is that the meteor was approximately 20 meters in size, moving at roughly 19 kilometers per second. …a gram-scale starchip would burn up in the atmosphere of a planet much more easily than a tonne-mass asteroid. Its impact on a planet would be no more irritating than the impact of a dust grain on the skin of a grazing cow. The interplanetary medium is full of debris that poses far greater risks to a planet, as the dinosaurs realized when wiped out by the impact of a 10-15 kilometer asteroid (a trillion times more massive than we just considered) some sixty five million years ago. In any case, Loeb sees the chances of collision at something less than one part in a million, given the fact that knowing the relative positions of planet and spacecraft over a journey lasting decades is impossible with the payload as envisioned. What Breakthrough Starshot does expect is a closest approach thousands of times larger than the surface of any planet. We should pause on the deceleration question, which comes up repeatedly whenever I talk about Starshot probes with people new to the project. While it is certainly true that deceleration and orbit in, say, the Proxima Centauri system would be a huge benefit, there is no way to make it happen given the current constraints on the payload, which relies on miniaturization and nonetheless requires vast energies to be brought up to cruising speed. Our initial interstellar efforts will surely be flybys for this reason, and there is a wealth of science that can be gathered. The other thing to be remembered is that Breakthrough Starshot is an ongoing effort to demonstrate the feasibility of beamed laser sail technologies. Submissions from the first Requests for Proposals are being evaluated as sail stability and materials are considered by way of moving toward experimental work in what we can hope will be a dedicated sail facility. The laser array that would drive these craft presents huge challenges of its own, as do the many other issues, like communications, that will have to be resolved before any interstellar mission can be flown. We’re looking at an interstellar capability that, if everything were to go well, would still take 30 years to produce a working infrastructure. To those new to Breakthrough Starshot, I recommend looking at the list of technical problems that face the project as it determines whether the concept is sound enough to move to prototype stage enroute to a full deployment. This is going to take time, and we won’t know for quite a while whether the Starshot concept, as is, is workable. What we do already know is that the commitment of resources underlying the project is already paying off, and will continue to pay off, in the form of newly funded research. Anyone familiar with the history of interstellar flight studies will know how rare it is to have this level of cooperation and participation among the scientists best equipped to tackle the problem. For most of the past century, researchers interested in the interstellar conundrum did their work in their spare time and met only at the occasional conference, with infrequent journal articles maintaining the thread. The research Breakthrough Starshot will produce will thus be a solid advance for the entire field, no matter if, when or how often the actual missions are flown. At 0.2 c a lot of energy will go into x-rays and UV which are absorbed by an atmosphere like ours. The chance of a hit are pretty small I would think. Thanks again to Yuri Milner for his financial commitment to this project. A question that came to my mind was: if another intelligent race launched a series of low mass, high speed probes at our solar system would we be able to detect them as they raced through the system? Even if one or more probes intercepted a planet or moon would we detect the strike? My best guess is that we would be entirely unaware of the event. In fact it may already have happened. Dr Loeb addressed the impact of a starship probe traveling at 10 percent of c the starship goal is 20 percent of c. Would that change his estimation of the impact (npi) of a starship probe? Also, what would a starship probe impact on a body with no atmosphere look like? Would we notice such an impact on our moon for instance? Definitely yes, but you’d have to be looking to see the flash from the impact. The large debris cloud will persist and that would be detectable for hours and probably for days. Even with our technology we could pick it up on radar, but there would not be a lot of time to stop it if it was on a collision course with Earth. Any more advanced civilization especially with interstellar travel would have better defenses with radar bases throughout the entire system for early warning. They would have no problem in deflecting it or destroying it and would easily be able to figure out with radar and telescopes that it was not an attack but a primitive interstellar propulsion system and probe. I was most worried about the sail taking the laser and communication but previous posts on sail design seem promising. I really felt better about communication after looking at the page. I have always been optimistic about the nanotech and not worried about the dust because its a large number of probes. I agree thanks to Milner. He got everyone together and focused on near term technologies not 500 years from now. I think if the porototypes work funding will happen. Their costs estimates are really encouraging. About the cost of the space station much less than Apollo or Mars. I am a go slow on Mars because of the contamination issue. Us contaminating Mars. Its impossible to make humans sterile. I would like to see a Mars Venus flyby in the next decade and the prototypes for breakthrough starshot. My only thought is perhaps a moonbase. Maybe that would be a good laser location ….though maybe politically impossible. If the laser array is built on the far side of the Moon, it would be politically acceptable as it would pose no threat for Earth. Other than the obviously advantageous absence of a significant atmosphere, the Moon may have another advantage because it is turning on itself slower than the Earth does, so we could keep the laser focused and pointed to the same exact direction with less effort. I would place it on the far side but close to the South Pole Aitken Basin, as Alpha Cen and Proxima are in the southern sky, and this way we could power it with solar panels strategically installed on the peaks of eternal light at the lunar South Pole so it could charge continuously. However we should also be able to aim it at other nearby stars, so perhaps an equatorial position is better suited (but that means we should build nuclear plants on the Moon too, or have huge batteries that would only be charged by the solar panels every 29 days, or still have the solar panels on the South Pole and use very long high-temp superconducting cables to carry the current to the equator). Unless you put a giant mirror or constellation of satellites with mirrors in far lunar orbit with a view of Earth to deflect the laser beam at Earth. I saw something like this on Jonny Quest once. I wonder if Breakthrough Starshot might be able to borrow a page from the Project Daedalus playbook, by launching a collision protection system ahead of the lightsail probes? The system might consist of “dummy” sailprobes, somewhat larger sail-only projectiles, or perhaps even dust or other, specially-prepared particles, which would take the brunt of oncoming, impacting interstellar dust particles (also, dust- or particle-dispersing projectiles could replenish the collision protection system at intervals). No, not really. First problem is the radar equation, so you’d need a lot of power focused in exactly the right direction. That isn’t likely unless you somehow already know it’s there. Second, assuming you get lucky by accidentally putting power in the right direction the relativistic velocity will impart a frequency shift that radar just doesn’t look for. That is, the reflection may in principle be detectable but will fall outside the radar receiver pass band. A minuscule flyby probe could be about as definitive as “a dust grain on the skin of a grazinc cow” in the progress away from Earth. Yet in our present state (of ignorance) it has potentially massive implications for advancing our knowledge of what’s around us. It appears to be a very worthwhile effort. But barring breakthroughs in physics and engineering, the only practical way for humans to travel interstellar distances would be on generation ships, for which we should seek to design long-sustainable self-contained ecosystems that could include humans. A starshoot probe at 0.2c would not “burn up” in the atmosphere. It would completely ionize and create a very thin column of ionized air for a few kilometers. It would look like a lightning bolt in the upper atmosphere. I don’t know the energy of typical sprites, but it would probably look like a very bright sprite. At any rate, we seem to have some sort of consensus that a strike by one of the probes would not be devastating to a civilization on alpha proxima b. The mass just seems too small to be a real threat even at 0.2 c. As we grow more capable however larger probes at relativistic speeds could become a hazard. Does anyone know the upper limit for a mass that could still be accelerated to 0.1 or 0.2 c by a massive laser or complex of lasers? We would have to assume some sort of finite laser power. What about a terawatt? It would be interesting if someone could calculate the mass that could be accelerated as indicated above. So in other words, at what point would humans become extremely dangerous to other hypothetical civilizations if we continue to send probes of gradually increasing mass to other star systems at relativistic speeds? We should send a radio/TV message ahead of launch time, describing exactly what’s being sent, its purpose, technical details (weight, dimensions, material properties) and expected trajectory, along with a countdown to its anticipated arrival. Re-transmit the message every year while the probes are enroute. Use the language of mathematics and physics, which should be knowable by any advanced technology, and stress that this is a peaceful scientific mission of exploration. Just common interstellar courtesy. Imagine the reaction by the so-called most intelligent species on this planet if an alien message arrived telling us that one of their probes is heading our way and not to panic even if it accidentally hits Earth’s atmosphere. I mean, it’s not a bad idea per se – and this comes from someone who continually advocates that ALL deep space vessels carry information identifying its purpose and the species and world so as not to worry any recipients among other goals – but how to communicate all that you have said and in what manner, how much, what range of frequencies on the electromagnetic spectrum, etc., that’s the big question. We don’t know if they will get it or even if they do get it, will they GET it? Do we need too? Just an artificial radio/light signal will direct attention to the sky in the direction of the probe. If the probe emitted a similar pattern but doppler shifted, that might well indicate that an object was traveling at the implied doppler shift velocity. Drawing attention to the probe should at least indicate that it isn’t a stealth attack and that its size and mass can be calculated to be harmless if it impacts the atmosphere. The signaling may not be a universal means to imply non-aggression, but there are so many biology analogs that ET may understand the intention. By the way – the laser beam of Breakthough Starshort it self is this signal to ETI , that will travel in direction of the probe with speed of light, there is no need especially send any additional signal. In any case I suppose that ETI will decode message from signal significantly later than probe will plague (if even) their planet. So idea to send some special dedicated “advertising” of probe arrival is nonsense, sorry. What might truly upset aliens–and us–would be a self-replicating probe that arrived, set up shop in the destination stellar system, and started mining local bodies to make copies of itself, especially if it refused to acknowledge the locals’ attempts to communicate with it (“Where can we find the Von Neumann or the Freitas, so that we can sacrifice him for stealing our resources…?” :-) ). There is a sparse meteor shower called “the April Fireballs”. If you live in a warm climate and have a clear April night. It’s fun to take out a reclining arm chair and hope for a bright fireball. The shower does not peak on any specific date, but once in a while you’ll catch one really bright. If you’ve never seen a bolide, that’s a good time to try. The April Fireballs cause a lot of UFO reports. It is sad how many things create UFO reports by people who otherwise never bother to really look up at the sky or know anything about astronomy. This just continually muddles the field of exobiology, especially in the area of understanding ETI. As a lifelong amateur astronomer I’ve had people get really PO’ed at me for telling them UFO’s don’t exist. People who are not at all religious, devoutly believe in UFO’s, Area 51 and a government conspiracy about aliens. Of course, the Science Channel, the Discovery Channel and others constantly run UFO programs, so what can you expect? Critical thinking is often lacking even in otherwise educated people. UFOs and science fiction are our modern day myths and religion because they appear to be grounded in some form of reality however tenuous. The ironic thing is that those who otherwise dismiss science out of ignorance or other motives will be the first to glom onto it when they want to prove their belief systems. Would Starshot’s gram-sized probe even survive in the inner planetary system? The dust and even the grains of sand in an inner system would probably be denser than the interstellar medium. Would a tiny probe zipping through such a gauntlet survive long enough to threaten a planet? That’s a good question. Fortunately, in the case of the Alpha Centauri mission, the lightsail probes will be launched well south of the ecliptic (where most of the dust and [larger] meteoroids orbit, roughly in the plane of the Sun’s equator–and of the orbits of most of the planets [only Mercury and Pluto depart noticeably from it]), so they’ll avoid the vast majority of the Sun-orbiting particles. Another thought. An advanced civilization would presumably have many structures orbiting their planet. Not the tiny cans we’re putting up now, but gigantic habitats. These artificial satellites would be beyond the atmosphere, so Loeb’s counter-argument wouldn’t apply. Our probe wouldn’t burn up but would smash into a habitat with the force of a nuke. There could be so many orbiting structures that our little probe may have a hard time missing them all. Would the advanced aliens be upset that we hit them with the equivalent of a nuke? Maybe. This is just an assumption. I can just as easily argue that ETI will stay on their home world and go underground to live in virtual worlds of their own making. Why bother with so-called reality when you can make and live in whatever kind of world that you want? I suppose that Earth life is potential danger for any Extraterrestrial life / inteligence in Universe, this fact has little dependence from Breakthrough Starshot project. This project (Breakthrough Starshot) can only give to some (probable, virtual) ETI some direction where this danger (we) is located. I don’t think there is anything inherently wrong or inappropriate in trying to warn a possible civilization that one or more of our probes was on its way. It will be impossible to guarantee this will work but it’s a move in the right direction. A few hundred probes as is the goal with Breakthrough Starshot is a bit like firing a shotgun towards a target rather than a bullet and so the risk must be quite a bit greater. Still the mass of the probes is as much of a key as the velocity and if we keep the mass extremely low we surely are unlikely to do much damage. The receiving civilization might have different ideas as to what constitutes much damage however. I’m only half-joking here, but maybe it would be prudent to reach a consensus about which member(s) of the Breakthrough Starshot team would be “sacrificed” to hostile aliens (“He/she/they did it, not the rest of us!”) if one or more probes caused death and/or destruction in their home planetary system. The single-combat that sometimes decided the outcomes of wars in ancient times, when they reached stalemates (David versus Goliath is just the most famous example) is somewhat of a precedent for such a thing (the ancient Israelites’ scapegoat ritual is an even more similar one). One day in the not-so-distant future, light sails may hurtle through space at speeds of around 20% of the speed of light (or 60,000 km/sec), propelled not by fuel but rather by the radiation pressure from high-power lasers on Earth. 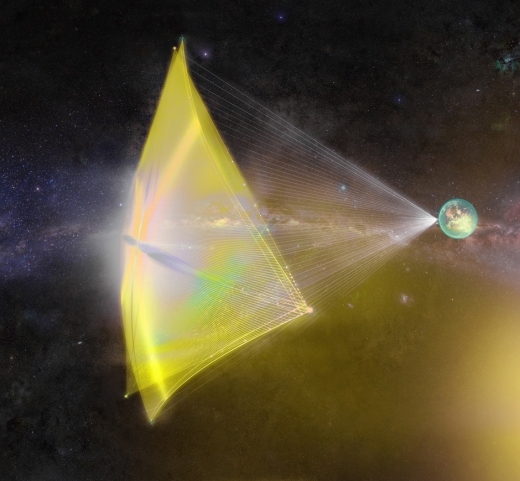 Traveling at these relativistic speeds, laser-powered light sails could reach our nearest neighboring star (other than the Sun), Alpha Centauri, or the nearest known potentially habitable planet, Proxima Centauri b, in about 20 years. Both objects are a little more than four light-years away. In a new study published in Nano Letters, researchers Ognjen Ilic, Cora Went, and Harry Atwater at the California Institute of Technology, Pasadena, have shown that nanophotonic structures may have the potential to meet the stringent material requirements for light sails capable of traveling at relativistic speeds. Previous light sail designs have used materials such as ultrathin aluminum, various polymers, and carbon fiber. Unlike these materials, nanophotonic structures have the ability to manipulate light at subwavelength scales, giving them an advantage in addressing the simultaneous requirements of efficient propulsion (reflection) and thermal management (emission). As an example, the researchers showed that a two-layer stack of silicon and silica shows promise due to the combined properties of both materials. Whereas silicon has a large refractive index—which corresponds to efficient propulsion—but a poor cooling ability, silica has good radiative cooling properties but a smaller refractive index. In their paper, the researchers also proposed a new figure of merit that measures the trade-off between achieving a low sail mass and a high reflectivity. In the future, this concept will help to minimize constraints on the laser power and the size of the laser array.